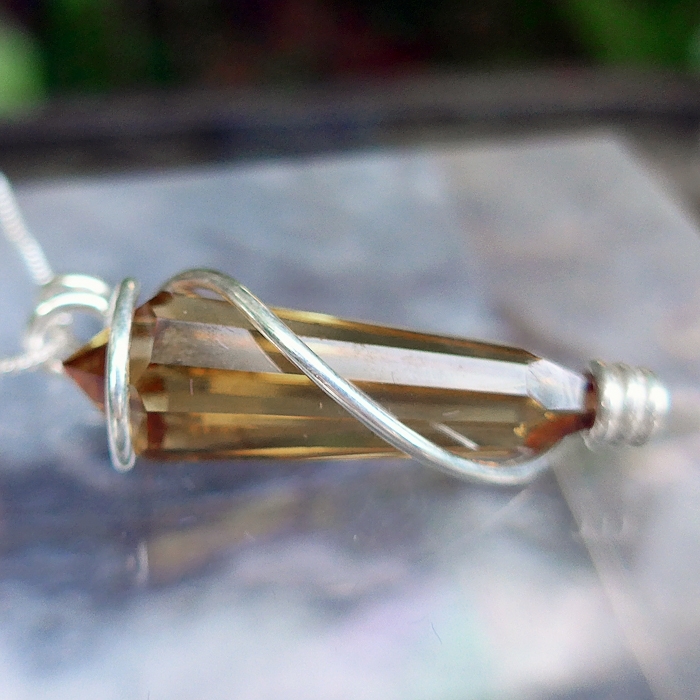 Dimensions (HxWxD): 1.55" x 0.5" x 0.375"
This stunning 1.55 inch long Water-Clear Citrine 12-sided Scalloped Mini Kabbalistic Wand Pendant is based upon energy healer and IBM scientist Marcel Vogel's original designs. This pendant wand is created by Paul Jensen, an American student of Marcel Vogel. Jensen is the creator of the Tools of Evolution line of sacred geometry jewelry. This pendant wand is precisely cut into the shape of the Kabbalistic Tree of Life, which was the original inspiration for Marcel Vogel's earliest designs for healing crystal wands. 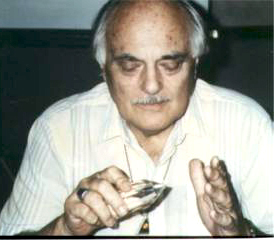 You can read more about Marcel's vision of the Tree of Life, the evolution of his crystal designs, and how to use Vogel wands for healing and meditation in our online e-book entitled The Crystal Wisdom of Marcel Vogel, which was written by Marcel Vogel and edited by Satya Center editor Curtis Lang. You can see the beautiful scalloped edges adorning each of the 12 major facets on this crystal where the shaft meets the termination tips, evidence of the superb craftsmanship. This pendant wand has a simple wire wrapping around it, with extra protection for the male termination tip. Both male and female termination tips are open so the stone can breathe and be used as a wand to amplify and direct Universal Life Force energy. This pendant wand has a very comfortable fit in the hand for any kind of energy work, a lightworker or meditator. It has a very nice feel to it, well-proportioned, slim, and tapering to a definitive point. It is water clear throughout. This pendant wand comes with its own velvet jewelry box for safe-keeping. Because it energizes the navel/solar plexus chakra, Citrine is said to aid in digestion and to activate the thymus, which regulates our immune system, thus promoting health and well-being. In addition, citrine is said to provide a feeling of comfort and optimism. 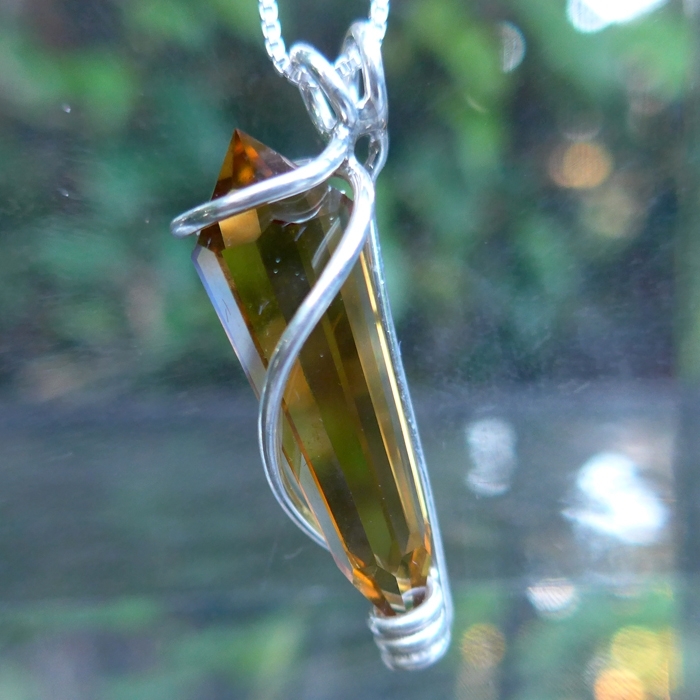 I must admit, that when I wear or work with citrine, I have a great sense of well being and protection. 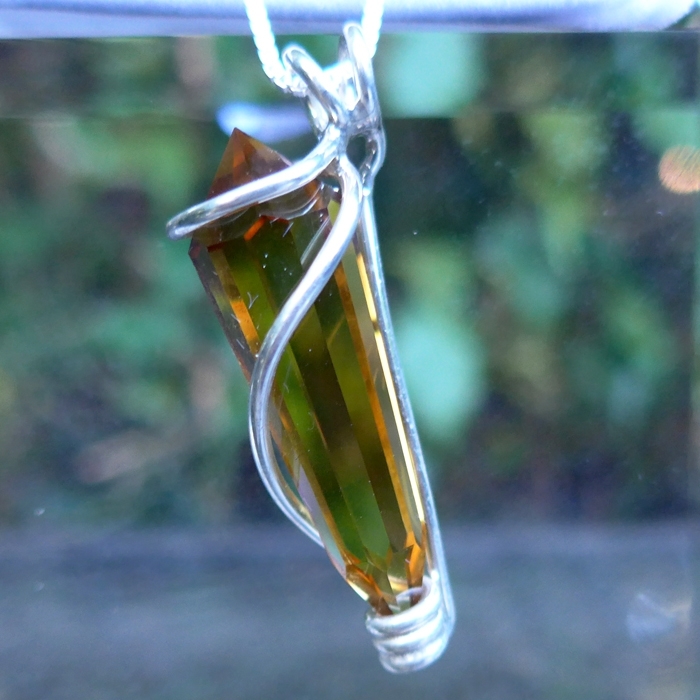 In addition, citrine is an ideal gemstone for protection. Used to strengthen the aura and surround the bearer in a bubble of golden light, citrine provides the bearer with a safe, secure personal space, free from the interference of negative or unwanted individual or collective thoughtforms, deleterious emotional states projected by others, and even inasuspicious astrological influences, which can be literally burned away when they encounter such a strong golden aura as citrine helps to create. When Jane and I have used citrine in Reiki and crystal energy sessions with clients, they have reported feeling a gloden glow around them. We have also found that citrine is a powerful tool for extracting negative energies, gently dissolving energy blocks, and releasing negative emotions during sessions. Weight above is shipping weight. Net Weight is .35 oz. or 10 grams. Each piece is unique and may vary in dimensions and appearance from the photos here. Each piece is guaranteed to be beautiful and to meet with your complete satisfaction!